To cook this recipe start by brushing lemon juice on both sides of the raw meat. Then sprinkle and gently 'press' the other seasonings (salt, pepper, and hot pepper blend seasoning, into the sides of the meat. Grill or broil the steak to your preference. Then slice the fresh tomato into thin slices, serve. 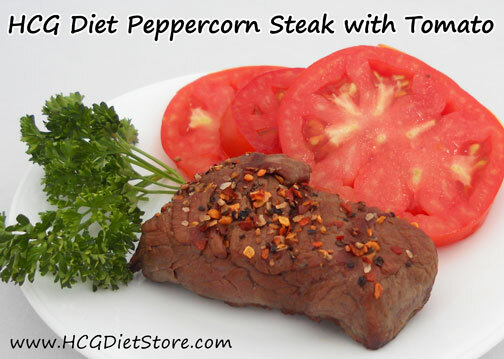 This recipe is allowed on the VLCD phase of the diet (also known as Phase 2 or the 500 calorie phase). This recipe equals 1 serving of meat, 1 serving of vegetables, and part of your daily allowed juice squeezed from a lemon.